I had a few hours to kill after landing at the Frankfurt airport. Since Frankfurt is not one of the obvious tourist attractions of Germany, I had never visited the old city center. I entered the historically significant Paulskirche, where representatives from all over Germany met in 1848 to discuss German unification and a constitution for Germany inspired by the French revolution. But reactionary forces gained the upper hand and the so-called 1848 revolution was squashed by the middle of the next year. Today the church is a museum commemorating the constitutional convention of 1848/9. On the walls inside the church you can read the proclamations that were made by the convention in the Paulskirche. I am surprised just how similar the principles are to what was enacted in 1919, ushering in the Weimar Republic. It now becomes clear to me that convention in 1848 was not the failure that history books had made it out to be. 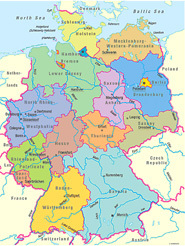 The convention wrote the blueprint for all future democratic constitutions of Germany. After leaving the church, I went to a little souvenir shop across the road. Next to many postcards of Frankfurt today it had a two postcards that show what Frankfurt looked like right after World War II. These pictures send a clear message: It is not a good idea to elect people in the highest office who are crazy. 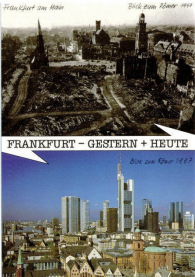 During what now seem twelve short years (the period from 1933 to 1945), the dreams and delusions of German citizens led a catastrophe that is symbolized by destruction (see photos) of such historic cities as Frankfurt. 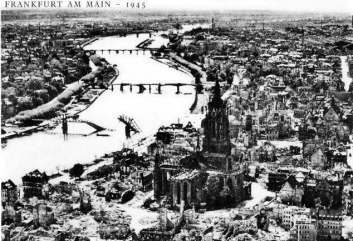 Thank God that Hitler was so fond of Paris that he gave a strict order not to bomb the French capital otherwise Paris would look like modern day Frankfurt. Flashback: Entering the visitor center of the Temple of the Mormon Church in Salt Lake City, I was greeted by two young believers who welcome everyone with a warm and open heart. I could sense right away why this religion is expanding vigorously: It is offering you a family and community feeling that promises to shelter you from the impersonality of modern life. We really would like you to join, Peter. We have been waiting for you. This is the spirit conveyed methodically. Entering the Cathedral in Barcelona I am not greeted by a human being but rather by picture of the cold bureaucracy of Roman Catholicism. 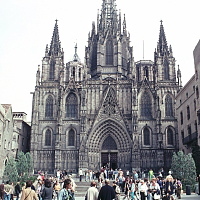 If all the Church of Peter can tell when you come to visit is that must not show too much skin, it is no wonder that people in Europe are turning their backs onto the church. The spirit of Jesus has been driven from this house. The dark and tall cathedral feels like a Mausoleum and I am glad when I am out on the street again, going for a walk along the architectural marvels of the boulevard Garcia. 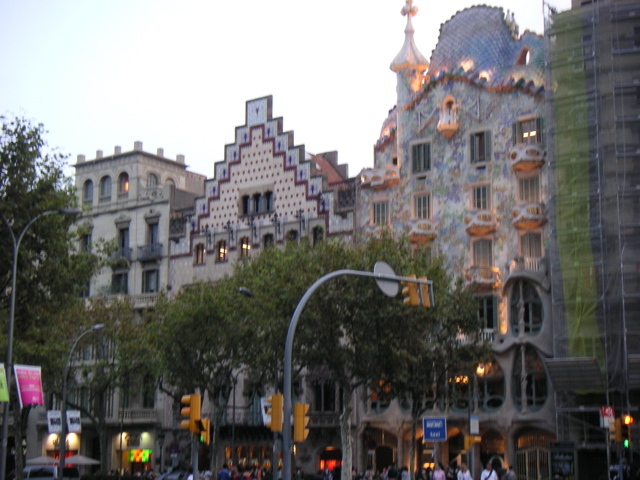 Barcelona resonates me much more deeply with me than Madrid. Why not live in Catalan city by the sea for a while? I spent less then twenty-four hours in Berlin. On the way back to the airport, I was picked up by a lady who likes to do things a bit differently. In Germany, eighty-five percent of taxi cabs are Mercedes Benz cars. 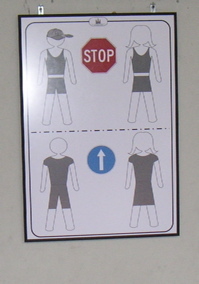 But if you call her up (+49-170-434-02-06), she will chauffer you around Berlin in a London taxi. After September 11, business is slower for taxi drivers everywhere in Europe and America, giving them time to talk about their plight. The fastest way from my hotel to the airport took us along the old parliament (Reichstag) building. On a previous visit, I had seen the new glass top of the parliament building. Symbolically and architecturally, the glass dome is very appealing. Now I passed for the first time the newly constructed office building for the members of parliament, which lies across from massive new chancellery. Both buildings are modern in spirit, straight lines everywhere, no ornamentations, lots of glass. Although the buildings are not particularly bad, I found quarter mile area between the two distressingly sterile. I realized that what was missing were trees and vegetation. Life locked away. It was all glass, stone, and asphalt. 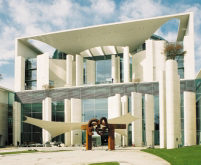 The German government paid about 10 billion Euros to move its operations from Bonn to Berlin. The trees were not missing for a lack of money. In July I had a chance to visit Germany. I wanted to see not the big cities but smaller places. Weimar, a small city in which Goethe spent most of his life and later became synonymous with German high culture and the failure of the short-lived German Republic, 1918-1933, proved to be a feast for one’s eyes. Early in the 19th century, the poet Schiller also called Weimar his home. The town, situated in the middle of Germany, has been beautifully restored and deserves to be on the intineary of every visitor of Germany. In the map to the right Weimar lies just a bit west of Erfurt in the state of Thuringa. Travelling through Southern Bavaria, I also came through a beautiful small village of Neubeuern. The place has been voted in 1981 as Germany’s most beautiful village. Visit its website and see for yourself why. The village was built in medieval times half way up on a rock. At the very top of the rock clever people built a castle with a huge tower to see the enemies all the way to Innsbruck and Salzburg (this a slight exaggeration on my part). 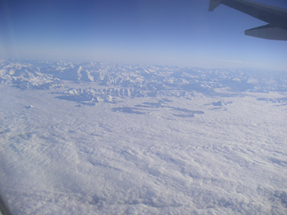 Here is a picture of the view towards Innsbruck. I feel a great affinity for birds because many of them travel a long distance to spend the winter in warmer climates. This winter I travelled to Tenerife for the fast time in over 20 years. I shall return soon to experience again this energizing and inspiring climate. I stayed in Puerto de la Cruz on the northern shores of the Island and had a spectacular view of the Orotava Valley and the Teide mountain that was covered by snow because it reaches over 3718 meters into the sky.